Real vs. Feel is one of the biggest issues with video analysis these days in that video shows what’s really happening. Coaches then adapt their player’s swings to try and match that of their visual analysis. The problem is, what the hitter FEELS vs. what actually has to happen in a swing are two different things. For example, the term “getting on plane” has been seen to mean drop the barrel earlier in your load/launch position to put the barrel on plane, sweeping up into the ball to create a better “launch angle” for the hitter. However, with only this visual “understanding”, coach’s will instruct a hitter to drop the barrel too much and too early, causing barrel misses under the baseball. I cue hitters to keep the barrel above the hands and hands above the ball as they drive their hands to the ball. As the body then rotates, the barrel will come around, drop below the hands through the wrist pivot into contact. The FEEL here is a term I call “bat stack”. If my hands are “stacked” I know that as my hands come around the barrel will follow and be right where i want it to be at contact point. What my players are learning during sessions is how to understand how the best hitters in the world apply their power and adapt these mechanical changes to their swings. Hitting is controlled chaos from the load, launch and explosive swing. It takes concentration, strength, timing and rhythm consistently over time to create a mechanism for chaos. Style is added later or worked around. Starting with slow-motion controlled movements hitters learn to feel the positions that your body must pass through during a swing. This comes with patience, time and painstaking detail. You train the body to move using every bit of leverage you can provide. It starts out slowly. Movement patterns that hitters have grown with and developed over the years are tweaked or removed altogether. In the words of Yoda “You have to unlearn what you have learned.” I’ll twist and move hitters into position so they feel and understand that body position. It can be uncomfortable though necessary to develop FEEL. Through movement after movement, using slow-mo video hitters begin to re-pattern their movements to get the desired effect. Progress is shown in the results in the cage. the reprogrammed movements are committed to memory…muscle memory. 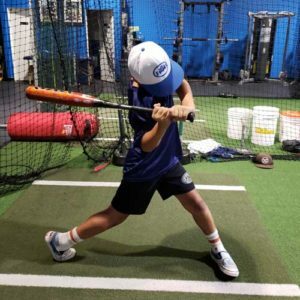 Once a hitter understands what the correct movement FEELS like, now the real training can begin. 200 pitches a session. We use every drill engineered to copy the desired swing path for every pitch in the strike zone. Hitters are drilled with changeups, curveballs, sliders, anything I can throw to them while the hitter is keeping his 100%, #1, prime time swing locked in. Finally, batting practices can become competitive and self-driven by the player. A little game within himself to see if he/she can drive the ball as far and hard as he/she can hit it. I hope this helps you understand feel vs. real. What is actually happening is different from what you feel is happening. Video works wonders if you analyze it correctly. Good luck. ← What is little league elbow?